The fact is that when homeowners add a sunroom onto their home, it very quickly becomes the most-used space in the entire house. What’s not to love about a room that lets you enjoy the beauty of the outdoors without any of the drawbacks of being outside? Let Surber’s Windows and Sunrooms help make your dream of owning a sunroom a reality. So, what exactly makes installing a sunroom a valuable investment for Midwest homeowners? It’s an inexpensive way to add square footage to the home – less expensive than full-scale construction of a traditional room addition. Plus, Surber’s offers several options for financing to qualified homeowners. Surber’s sunrooms provide year-round living space, as opposed to some alternatives that aren’t practical in the winter. A sunroom allows you and your family to enjoy the ambiance of your beautiful backyard without having to deal with any of the nuisances, like pesky bugs, unexpected rain, or windblown leaves and debris. 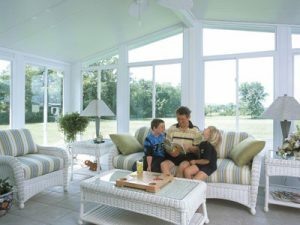 Surber’s is proud to be certified for custom sunroom installation with Joyce Manufacturing, a specialty brand offering vinyl sunrooms, and has been working with this outstanding brand since 2000. Our most popular sunroom, the Oasis 2600, provides livable space all year round and features vinyl sliding windows that easily lift out to full fiberglass screens. While there are many companies out there installing sunrooms made of aluminum or other materials, we choose vinyl for many reasons. Most importantly, vinyl is a natural insulator and loses less heat than other materials. Vinyl is also a non-conductor of electricity and won’t scratch or show dents. Furthermore, it boasts a sleeker finish with continuous color throughout and is very easy to clean. If you’re not quite ready to commit to a sunroom addition but still want to create an enjoyable outdoor living space, Surber’s has some other options available. We can build a screen room for your home, which will still allow you to enjoy the outdoors, but on a seasonal basis. Or, we can install a patio cover that provides shade and cover from the elements for your outdoor area. Ready to learn more? Contact Surber’s Windows and Sunrooms today to schedule an in-home consultation.